New England’s temperate summer climate and bounty of parks and green space make it a prime location for outdoor fitness. Think of exercising in Boston, and it’s hard not to conjure images of hundreds of runners putting in miles along the Charles River Esplanade, bikers pedaling by, and the river dotted with kayakers and rowers. But those who merely run, bike, or row outside without incorporating strength training and full-body stretching into their routine are missing out on working important muscle groups and burning more calories, say local fitness experts. The good news is, there’s no need to go indoors to get the strength training and stretching you need. State officials are ramping up the construction and renovation of open-air gyms — also known as parcourses — in response to the popularity of exercising in the great outdoors. The Esplanade — the darling of Boston-area running trails — not only offers breathtaking views of the city’s skyline and the Charles River, but also now boasts one of these Venice Beach-esque outdoor gyms. Located on the Boston side near the footbridge across from Silber Way, the parcourse features recycled rubber matting, pull-up bars, benches, and even signs offering workout circuit how-tos, Thurlow said. The state ripped out an older wooden structure that used to withstand arson and graffiti in 2006, replacing it with about $60,000 worth of new materials as part of a larger beautification project along the Esplanade, Thurlow said. Mark Safer and Simran Ahluwalia demonstrated outdoor exercises. The state also oversees outdoor workout structures near the new Jackson Square playground in Jamaica Plain, Magazine Beach in Cambridge, Breakheart Reservation in Saugus, and Middlesex Fells Reservation in Medford, Thurlow said. He said state officials expect to build more of the outdoor workout spaces as the funding and opportunities arise. 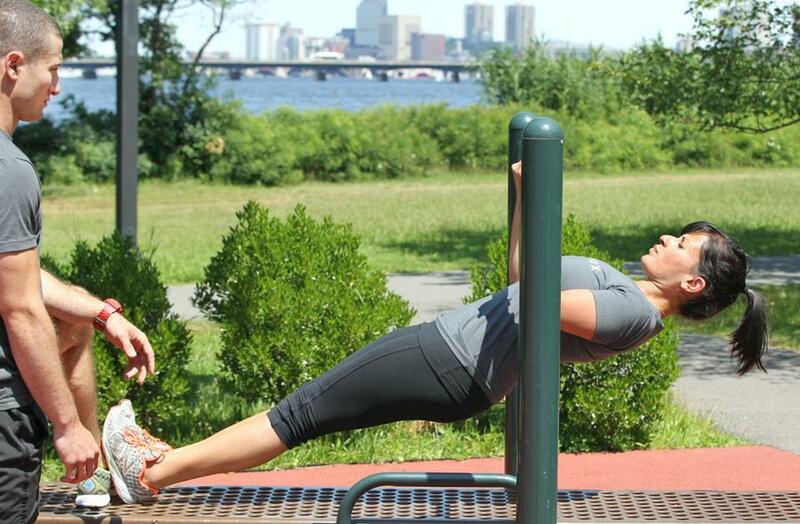 “With the interest in physical fitness, this is a great way to provide that to the public,” he said, adding that Boston was one of the first places to install an outdoor gym at the turn of the century near the Lee Pool area on the Esplanade. “They called it a playground, but it was adult physical fitness equipment,” he said. Fitness experts now say that anyone ignoring the easily accessible outdoor equipment — or even that stray branch, picnic table, or bench along your jog — are depriving themselves of a full-body workout that can help build strong, lean muscle and lead to zapping more calories in the long run. Equinox trainer Simran Ahluwalia said outdoor joggers who bodyweight train reap a plethora of benefits. Plus, there are myriad benefits to fitting in a workout routine outdoors — besides the stimulating views and low cost, Ahluwalia said. Safer and Ahluwalia said runners can use any flat, hard surface along a running path to practice several all-body stretching positions from the “Animal Flow” routine, a circuit of animal-esque bodyweight exercises designed by former Equinox personal trainer Mike Fitch. For stretching, the trainers recommend the “Downward Dog,” starting in a push-up position and lifting the hips until the body makes an inverted “V”; a reverse lunge, taking a step back and lowering into a lunge position while lifting the arms above the head; and “The Windmill,” standing with feet about hip-width apart and reaching one hand down to touch the opposite foot. For strength training, the pair recommend inverted rows, which essentially look like an upside-down pushup, using a horizontal pole to pull oneself up; a split squat, where one starts in a half-kneeling position and pushes to a standing position; and step-ups, which can be used on unoccupied park benches or any other elevated prop. “These should be done in a rapid-style workout circuit, with about five in a row with no or minimal rest in between,” Safer said. Many of the trainers’ workout moves can be performed either on parcourse equipment, or using objects found normally along runs and in parks. For example, for variations on the stereotypical pushup, Safer recommends using props to elevate the legs for a more challenging workout. Those with little upper body strength can elevate their hands on a curb, bench, or table, he said. @globe.com. Follow her on Twitter @JaclynReiss.